Did you play Gunpoint? Gunpoint was very cool, and designer Tom Francis has since been working on another sandbox action game with the sci-fi-themed Heat Signature. The new game will be out September 21, and there are two cool but bizarre promotions in store for launch week. There’s always more to explore on the final frontier with the best space games on PC. The first is an opportunity to have a Steam trading card bearing your name. If you play the game before September 28 and make a brief clip of something interesting happening to you, you might just have the opportunity to be bought and sold for pocket change on the Steam Market. Who could say no to that opportunity? Check out the details here. You’ll also have an opportunity that week to pick up the Everything Gun, a wildly impractical item that inhales objects around you and shoots them out as projectiles. Picking up the item during launch week will unlock it as a potential random drop in perpetuity, but otherwise it’ll be pulled from the game as of September 29. 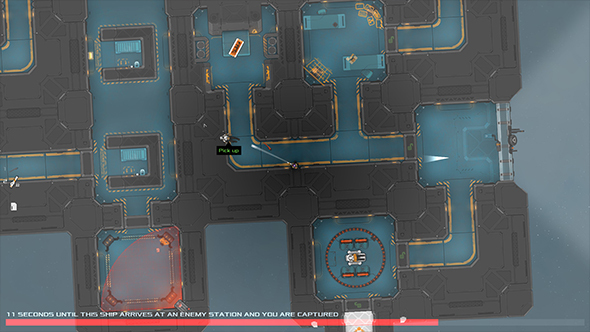 Heat Signature is all about infiltrating enemy spaceships and enjoying all manner of emergent chaos that results. You’ll hack turrets, throw wrenches, or explosively expose enemy guards to the vacuum of space. Or (more likely) you’ll murder yourself in the process. It also enjoyed a bit of apartnership from Valve on its development.